If you've upgraded to Payara Server 5 or are considering using Payara Server in production, here are 5 production features you might not know about - but should. 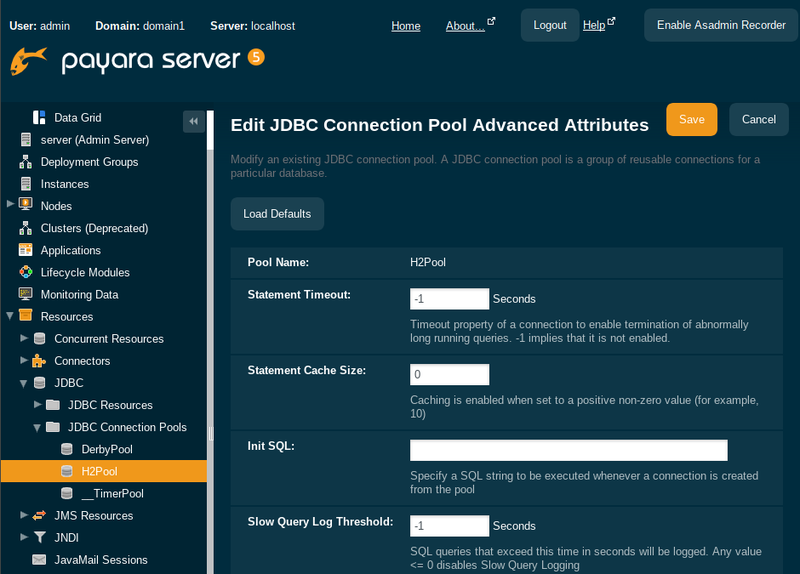 1)Payara Server Can Detect and Log Slow SQL Queries Executed Via a Connection Pool. The Slow SQL logger monitors all queries executed on the connection pool and if they exceed a configurable execution time in seconds, a warning message is logged into the server log. The warning message (see below) logs the SQL query and the stack trace to the code executing the query. This enables rapid diagnosis, pinpointing the exact lines of code to investigate. To configure slow SQL logging via the administration console, navigate to the connection pool's Advanced Properties tab and specify the Slow Query Log Threshold time in seconds. A value of -1 disables logging of slow queries. 2)Payara Server Can Display Real-Time Statistics from the System Shell Using asadmin. The command asadmin help monitor will provide detailed information about the monitor command. These commands provide exactly the same amount of information that is available through the REST interface. The last command corresponds to the following URL: http://localhost:4848/monitoring/domain/server/transaction-service/committedcount. 3) Payara Server Comes with a General Notification Service Which Includes the Request Tracing Service. The Request Tracing Service provides tracing facilities for multiple protocols and process communications done by the components of deployed applications. The service helps users to detect application slowness and performance degradation by logging requests that exceed a given threshold. The trace data from long-running requests gives insight to solving bottlenecks and other performance issues. Because Request Tracing (and other monitoring) services depend on the Notification service to output their data, both the Notification service itself, and at least one notifier, must be enabled for any data to be recorded. If this does not happen, then the data will be discarded. 4) Payara Server Comes With Customer Support Integration. 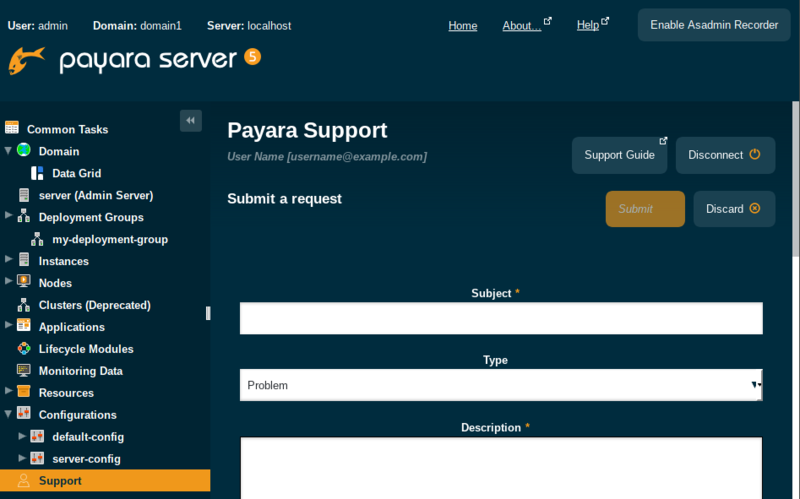 For customers with a support contract, Payara Server comes with a customer support integration which allows customers to raise and manage tickets within the Payara Server administration console. The support page is accessible from the panel on the left of the admin console, just below the configurations. Enter your support email address and password to login. If you don’t have paid support, click the button just beneath the login form to go to the Payara website to buy support. The Payara Server administration console allows you to log in, view existing tickets, filter tickets to find the one you're looking for, and create tickets and add relevant file attachments if necessary. The console makes it quick and easy to submit a request for support - just fill in the form and hit the submit button. Full details and instructions for using our customer support feature is available in the technical documentation. 5) Payara Server Provides Support for Custom SQL Trace Listeners. A SQL Trace Listener is registered against a data source and is called after each method call made on the JDBC connection pool. Payara Micro also supports SQL Trace Listeners which brings powerful operational diagnostics to your microservices platform. Take a look at the instructions in the technical documentation to write a custom trace listener in the Payara Platform. Want to learn more about using Payara Server in production? Take a look at our In Production Resources. If you need help migrating to Payara Server or supporting your production Payara Server environment, consider our commercial support services. 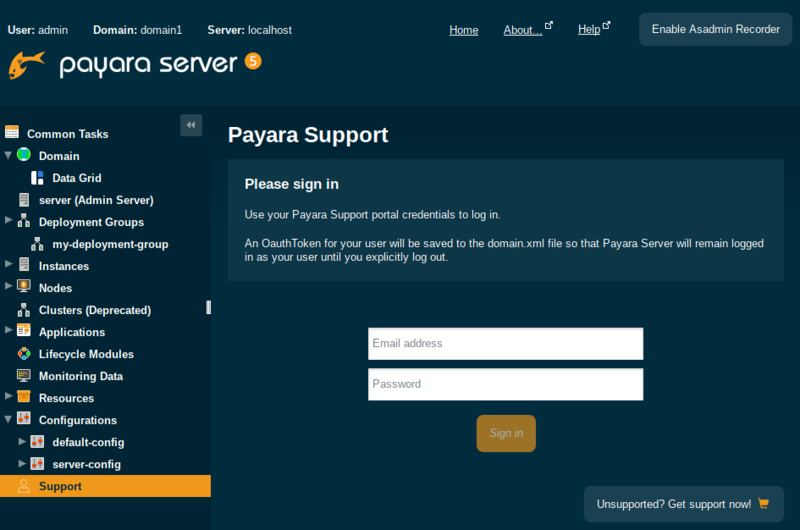 If you're not yet using Payara Server, download the open source software and try it out!